Congratulations to Queensland Japanese Services (QJS) for achieving Advanced Ecotourism Certification for their Green Mountain Tour and Glow Worm Tour. These newly certified experiences by QJS offer Japanese language, nature-based tours in Australian National Park settings. The Green Mountain Tour takes visitors on a day tour at O’Reilly’s Retreat nestled in the UNESCO listed Lamington National Park. Customers experience the ambiance of a small country town and Alpaca farm, and witness the breath-taking beauty of the hinterland and experience the sights and sounds of native flora and fauna during a tree-top walk. For more information on the Green Mountain Tour, click here. The Glow Worm Tour is an evening tour located at the World Heritage listed Natural Bridge at Springbrook National Park. The tour features glow worm viewing in the Natural Arch cave, a stunning, cascading waterfall, wildlife spotting and star-gazing. Customers learn about the lives of glow worms, while gaining an appreciation for the unique environment they live in. For more information on the Glow Worm Tour, click here. For more information on Queensland Japanese Services, please visit their website. We at Ecotourism Australia would like to congratulate our certified operators who received T-QUAL Grants for innovative tourism product development projects in the last round for 2013. The T-QUAL Grant program is a fantastic opportunity for tourism operators who already have innovative development ideas in the pipeline to put the cogs into gear and receive funding to help set the process in motion. We’re excited to see how our certified operators ideas develop. For more information on the T-QUAL Grants program, click here. A recent study conducted in the Wet Tropics World Heritage listed area and surrounds, in Queensland, has revealed some valuable insights into visitor attitudes towards ECO certification programs. It found differences in perceptions depending on visitor characteristics and the types of tourism products on offer, with some interesting results. Overall, visitors under the age of 50 were found to place higher importance on the environment and conservation efforts by operators than older visitor groups, while overall, females placed higher importance on environmental responsibility than males. Visitors judged the performance of ECO certified operators to be higher than non-ECO certified operators and customer satisfaction was found to be higher at ECO certified accommodations. Research found that the attributes of ECO certification, including; nature, interpretation, environmental sustainability, conservation and community, were deemed more important at accommodations than at attractions and on tours. This suggests that in accommodations, the alignment between the attributes of the ECO scheme and the visitor perception of these attributes is at a positive level. The fact that these attributes were not considered as important at attractions and on tours within a World Heritage listed focus area is quite surprising. The lower importance scores at attractions and on tours indicate there is a potential need for increased effort in raising public awareness on the importance of the attributes of ECO certification. When it comes to nature, aesthetic appeal was rated more highly than ecological processes. While guests were generally concerned about the state of the environment, they showed more concern for aesthetic appeal than for the ecological processes associated with achieving and maintaining it. The study also found that visitors yearn for a deeper sense of connection with nature and community. Interestingly, interpretation was deemed more important by visitors than conservation, environment and community. These findings indicate that while visitors like to feel a ‘sense of place’, achieved through interpretation, they might be missing any underlying messages on conservation, environment and community. Guests also valued green practices more highly when they were guest-related as opposed to focusing on reducing negative ecological impact, which oftentimes is a behind-the-scenes focus. They were more likely to make choices based on environmental aspects if they were able to see or feel them directly. This suggests that visitors respond better to ECO attributes if they feel that they are making a positive contribution themselves and are able to witness the benefits firsthand. These research findings give us valuable insights into the effectiveness of ECO certification programs, and indicate areas that could do with improvement, providing the opportunity for forward movement. The overall positive findings on the high performance levels of ECO certified operators in comparison to non-ECO certified operators comes as great news for those operators already certified, and provides incentive for others to consider joining the ECO scheme. For information on ECO certification, visit Ecotourism Australia’s website here. National Parks Minister Steve Dickson has today announced the new Queensland Eco and Sustainable Tourism (QuEST) policy, making way for exciting new ecotourism developments to take place within Queensland National Parks. 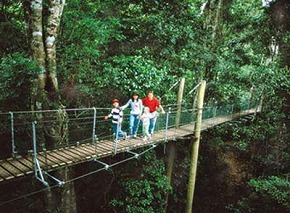 The QuEST policy replaces the Tourism in Protected Area policy and will open Queensland’s National Parks to all visitors, domestic and international, allowing for development of new and existing attractions and protected areas while promoting best practice operations, requiring certain standards of ECO certification. “We’ve created a streamlined system to reduce red tape and costs for operators while promoting best practice standards by requiring compulsory standards of eco-certification” says Mr. Dickson. The new QuEST policy claims to be a clear-cut, efficient and industry-focused improvement on its precursor. The main differences include streamlined application processes, increased term of authority from three to 15 years, extended renewal periods, flexibility for transferal of agreement if the business is sold, and minimum standards of ECO certification with incentives to achieve higher standards. Mr. Dickson notes that “Queensland has five World Heritage areas, more than any other state, which gives us a unique competitive advantage in both domestic and international markets”. The updated policy makes way for optimisation of the State’s natural assets, while ensuring they be developed responsibly and sustainably. Queensland’s National Parks and Protected areas currently receive 51 million visits by Australians annually, which sheds some light on their exponential contribution and importance to Queensland’s economy and tourism industry. The new QuEST policy aims to promote ecotourism development in these areas while providing incentive for maintaining a high standard of operation with respect to maintaining the quality and integrity of these sites. The QuEST Policy is expected to be implemented in stages based on location. To find out more about QuEST, click here. Introduction of the new policy will see existing and new tourism operators within Queensland’s National Parks obtain ecotourism certification to meet amended standards. To find out more about ECO Certification, click here. The International Ecotourism Society (TIES) and the Institute for Tourism and Development in Germany have recently announced the 19th Annual TO DO! contest and applications are now open. The TO DO! contest is a world-wide competition in support of social responsible tourism. The aim is to redirect the focus of tourism to local communities and traditional cultures, while maintaining environmentally responsibility. Much of the eligibility criteria is covered in the Ecotourism Australia certification process, so many of our operators may be eligible to apply! Eligible applicants must successfully incorporate the interests and needs of the local population by actively liaising with the local cultural community during planning and implementation. They must also actively engage in ensuring fair remuneration and benefits to the local community, promote training and education, contribute to strengthening local cultural identity, and implement measures that contribute to sustainable tourism development and community initiatives. Prizes include 5000 Swiss Franc (approximately $5700) donations to award winners by The Swiss Foundation for Solidarity in Tourism (SST), two-year ‘basic organisation membership’ to the The International Ecotourism Society (TIES), as well as trophies and certificates for you to display your achievement. Award winners are required to attend the award ceremony to be held during the ITB Berlin Travel Trade Show, during March 2014. Australia has had two award winners in the TO DO! contest in the past. In 1998, the Aboriginal Art and Culture Centre in Alice Springs was recognised for their efforts towards socially responsible tourism, and in 2007, the Western Australian Indigenous Tourism Operators Committee (WAITOC) bagged a prize too. We encourage our Ecotourism Australia certified operators to check out their eligibility and enter the contest for their chance to be awarded this prestigious prize in recognition of their efforts. Entries close 30 September 2013. To find out more about the TO DO! contest, click here. To start your application now, click here.